Hone in on individual user preferences and prior onsite interactions to serve the right game types and promotions across the entire customer journey. Unify all of your customer data – including web, 3rd party, and back office data – and use it to deliver personalized experiences to each customer. Personalize experiences, content, ads, build landing pages, trigger behavioral messages, and run A/B tests across any channel – all from the same platform. Empower your marketing team to build, manage, and deliver personalized experiences without ongoing development and IT support. Leverage live behavioral data to get a clear view of player intent and preferences. 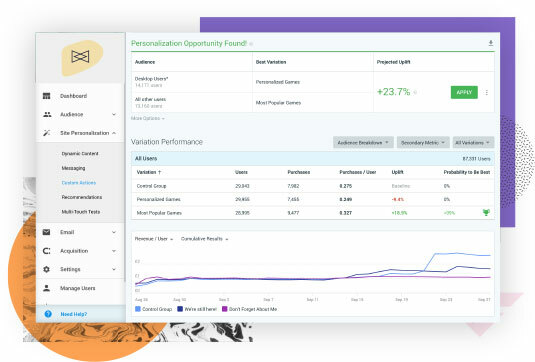 Build deep segments based on player activity, CRM data, referral data, and more, and discover actionable insights in real-time. Maximize each player’s engagement by personalizing layouts, sorting orders, promotional offers, navigation menus, content sections, landing pages, and more - based on individual user preferences. Drive conversions by emphasizing popular games, tournaments being viewed, or tables with limited availability. Choose and control the strategies and algorithms powering your game and sports recommendations. Always deliver the most effective variations to each user to maximize engagement and conversions. Automatically allocate traffic to the best performing variations to ensure optimal results. Target players with notifications and overlays to ignite engagement and recover lost revenue, from social proof messages, wheel of fortune overlays, exit-intent popups to email capture notifications, and more. Extend personalization beyond the web. Schedule targeted behavioral emails and personalized push notification messages based on a deep integration with your player-specific gaming data.